Project and Programme frameworks bring organisations significant benefits while reducing costs, if applied well. Firstly the consistency of delivery makes assurance and reporting easier. In addition this allows resources to be moved around much more easily between projects. 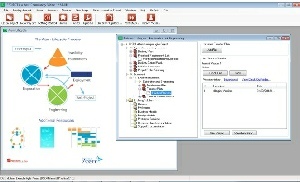 PROJECT in a box is unique because of its ability to support any process led documented activity (methodology). First of all we ship it with a number of different flavours of Project Management Methodology provided as standard. 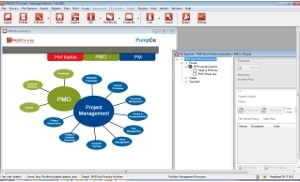 Hence you can easily set up standard projects with confidence. However, you can also personalise these to match your organisation needs. Finally you can even add your own custom methods if you want to. No other system offers this breadth of project management methodology off the shelf or depth of personalisation potential either. The complete authentic PRINCE2© method template provides all the materials of the resource pack structured into the process steps you need to document and deliver your complex projects or support your PRINCE2 learning. This is an Official licensed product approved by AXELOS. So you can be confident about the contents. Furthermore it can be purchased to add to any software edition. The PRINCE2© resource pack 2017 provides the full set of official PRINCE2 templates, extended with further content from the same author, these further templates are exclusively available here only. Links to other essential PRINCE2 materials, Glossary and processes etc. provided. Standard on all software editions. Generic five step project management methodology based on best practice and includes a full set of templates and resources. Official PRINCE2© and Atern template set revised to match the 5 step method. Especially relevant this method uses stages to help you structure your product complexity. Generic four step project management methodology based on best practice, including full set of templates and resources. 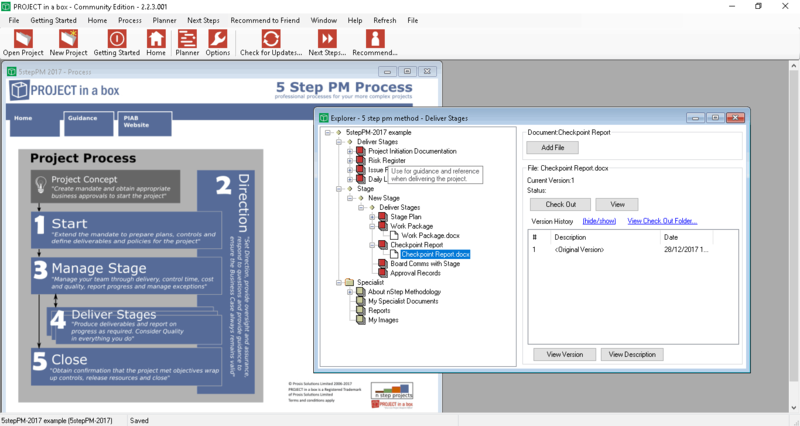 Mixture of templates from PRINCE2 pack and DSDM Atern. Further more this method uses multiple stages/work packages so you can build the type of project you want from the available stage types. We have included purchase, agile, product description based ones and you can also add your own. Generic three step project management methodology setting best practice for small and also low complexity projects. Providing a full set of templates and resources. Templates refined and revised from the official PRINCE2© set by the original author to match this 3 step method. Since this method is for low complexity projects it does not use stages. Generic one step method allows you to manage those tasks which don’t warrant a full project approach. Just one step with a work package definition and collection of task, cost and risk,issue information which integrate with the data from your larger projects. 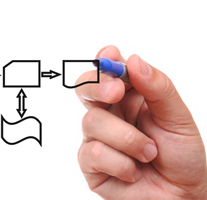 A gated process which first of all requires users to successfully complete idea information. 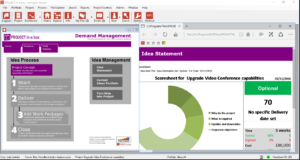 Also provided tools and reports to help the organisation select the best mix of ideas to take forward as projects. Finally ideas can be converted into 4 step projects for delivery as usual. Standard on all multi-user Editions. 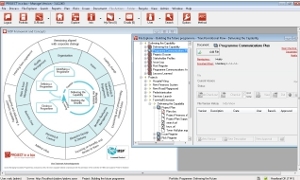 The Praxis framework with templates and tools to support a typical low complexity project along with guidance on implementation and tailoring for context. 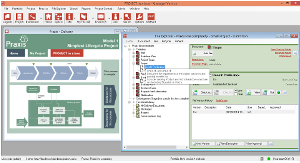 This is the first of a set of method templates to also address complex projects and programmes. Authentic MSP© methodology licensed and provided as an official product from APMG. Navigation, process, templates and guidance all packaged for your use. This is a commercial add on available for use on all software Editions. 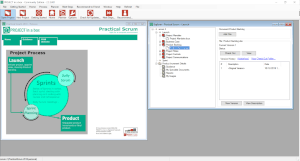 Practical Scrum takes the best of scrum and wraps it to make it work in a corporate environment. Navigation, process, templates and guidance all packaged for your use. Authentic DSDM Atern Agile project management methodology provided as an official licensed product from the DSDM Consortium. Navigation, process, templates and guidance all packaged for your use. 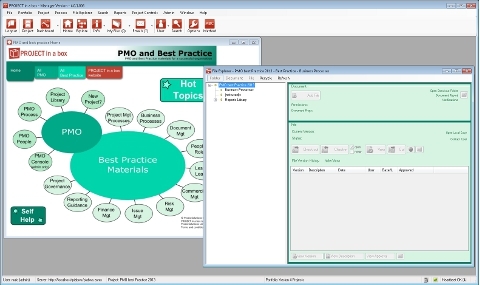 Using this method customers can assemble their best practice materials and control their availability to users. This is the perfect supporting framework for a maturing organisation developing and assembling this material for the first time in support of their PPM or P3O objectives. Provided as standard on STE and EE Editions. 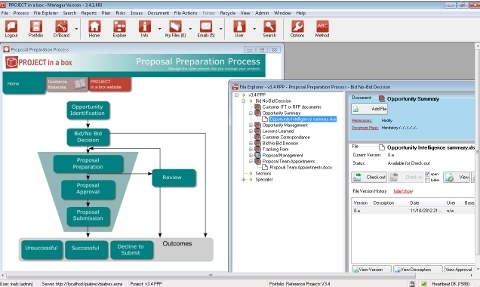 Proposal Preparation Process to help you manage your tender responses and proposals much as you would your projects. Because you want to get your sales activities off on the right foot with templates, process and guidance. 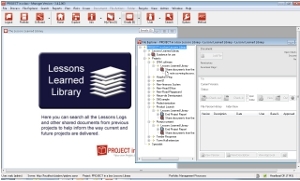 Lessons Learned Library providing you with a home for all lessons related material and yet indexed and searchable by keyword to help the projects that follow on after. Provided as standard on Small Team and Enterprise Editions. Furthermore, what makes PROJECT in a box unique is that you can personalise any of these methods. You would probably do this to match your organisations requirements, which is common. Finally even to create your own completely bespoke methods, processes and frameworks (only available on commercial Editions). When it comes to project management methodology you can trust us to deliver the goods. Partly because we have been the authors of the official Axelos/OGC/Cabinet Office PRINCE2 template pack for a number of years. But we have also been developing custom project management methodologies since 1998 and our generic Project management methodologies provided free in the application are now used very widely as practical structured approaches built on best practice and practical experience. Our MSP methodology template is an official licensed MSP Product and also the only complete set of assessed MSP templates available anywhere. For other methods we go to the experts and buy the best materials available. Therefore our DSDM Atern method template is licensed from the owners. As a result of our extensive experience in competitive tendering we produced our own Proposal Preparation Process methodology. So you can use this to assist with your sales activities. Our Lessons Learned Library methodology is also a great way to promote continual learning in your organisation. Unlike other suppliers we will provide you with the tools to let you customise your Project Management Methodology or even create your own bespoke ones, putting you in charge of the methods you use. We can also use our significant experience of assisting customers in personalising or creating bespoke methods to give you objective impartial assistance and advice on your methods.